Things are about to get Grimm again for Snow White, thanks to director Rupert Sanders. After directing high-concept, visually stunning commercials for products ranging from Nike, Absolut and DirectTV to video games “Halo 3” and “Call of Duty,” the Brit helmer makes his big screen debut behind the camera of “Snow White & The Huntsman.” His new take de-Disneyfies the fairy tale heroine, as played by Kristen Stewart, who contends with a genuinely scary Evil Queen (Charlize Theron) and a formidably hunky huntsman (Chris Hemsworth). Sanders shares his vision for restoring the darker dimensions to the fairest one of all. As you got to know her and work with her, what were the discoveries you made about Kristen Stewart, as an actress, especially in contrast to how people perceive her from the “Twilight” movies? I think what I realized is that she’s such a good actor that everyone thinks she’s Bella Swan. They believe that that’s her. Obviously, an actor is playing a role: she is nothing like Bella. And I got on really well with Kristen. As I was writing stuff, she was there. We had a lot of conversations, seeing through her eyes. We worked really hard on developing that character together. I was just amazed at her talent, really. She’s incredibly good at her craft. She’s incredibly instinctive. She’s incredibly intuitive. She will overcome fear like no one I’ve met, when it comes to it. She didn’t really want to ride a horse – she had a bad horse-riding accident as a kid. When you’re riding fast on a horse, with 200 other soldiers on horses riding behind you, through surf on a beach, that’s terrifying. She really went there. She crafted the accent, and it’s flawless. She’s a stunning actor. I saw her first in ‘Panic Room.’ Then, I saw her again in ‘Into the Wild.’ I loved her in ‘The Runaways.’ I loved her in ‘Welcome to the Rileys.’ I think she’s going to be incredible in ‘On the Road.’ She’s a great actor, and people just go ‘Twilight Girl,’ which is a testament to her. She’s kept this pipeline of interesting projects going on the side, so she’s not just going to be that girl, forever more. She’s a great actor and she’s made incredibly shrewd decisions for someone who’s half my age. Charlize Theron comes out in Dior couture at the "Snow White & the Huntsman" premiere in London. She says her adopted baby, Jackson, didn't even recognize her all glammed up in the Dior dress. Considering that, what were the challenges in ensuring that your film didn’t get distracted by the fact that this is the actress that so many people see as Bella Swan? I’ve never seen the Twilight movies, so I didn’t really care that much. I met her, I really got on with her, she’s a great actor, and she was right for the character. That’s it. It was as simple as that, for me. 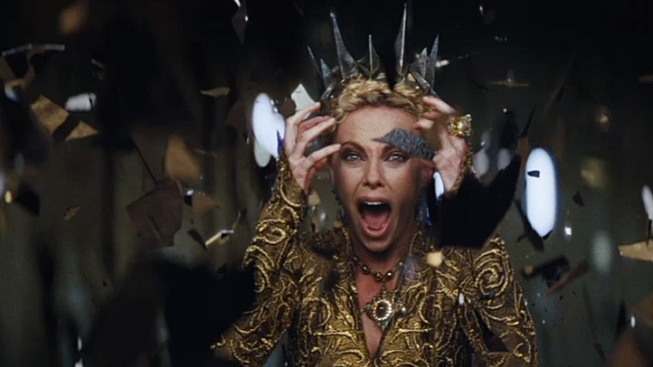 What did Charlize Theron bring to the role of the Evil Queen, which could have ended up being camp in the wrong hands? Kristen Stewart, Charlize Theron and Chris Hemsworth star in this retelling of the classic tale about an Evil Queen who puts a hit out on a woman destined to be even prettier than she. Opens June 2, 2012. When you’re playing an Evil Queen, you can go into pantomime very quickly. What she did – and what’s indicative of the film we tried to make – is that she grounded that in reality. She found a way of playing this character in a very modern, realistic and gritty way. She’s not ‘Off with her head!’ She’s not the 'Alice in Wonderland' kind of queen. It’s not that kind of film. She’s playing it pretty straight, as a very disturbed character who’s desperately got to find this heart because she needs to live forever. It’s as simple as that. She’s someone who’s dead on the inside, but she’s determined that she will avenge her family and the tribe that she was with, that was constantly brutalized by kings and by other kingdoms. She’s determined that the world will feel the suffering that she felt, and she will stop at nothing to do that. She’s totally dead. She doesn’t feel anything of life, but she has to get that heart and she has to live forever and she has to avenge her people. She’s very driven by some very dark machinations. She’s also incredibly wounded and incredibly fragile underneath. It’s an incredible performance. Will there be backstories for all of the other characters? Yeah, all of them have very rich backstories. They’ve all suffered a great deal of loss. This queen took over a kingdom. She’s someone who’s suffered a lot of loss. She lost her family, she lost a tribe, and she found her way into this kingdom. Like a Trojan horse, she moves from kingdom to kingdom, hollowing them out from the inside. She’s like a siren who attracts these people to her beauty. The dwarves lost everything. They were down in the mines. They’re noble goldminers who see light in the darkness. When they came up from the mines, the world was blackened and they lost all the other people in their race. The Huntsman lost a wife. Snow White lost a kingdom, both her parents, and the love of the people. Everyone’s dealing with loss, in very different ways. Initially, fairy tales functioned as parables, in a broader sense. What is the particular message you’re telling with this? What was your first exposure to the story of Snow White? And when did you learn about the darker elements of the Grimm fairy tales? I read that before I saw the Disney one. The Disney one is still pretty dark, even for Disney. It’s got ‘Bring me the heart, the lungs and the liver.’ It’s a brutal story. In the original, she eats the heart, the lungs and the liver, and then finds out that it’s a deer. And then, at the end, to really rub in her jealousy, Snow White invites her to the wedding and makes her dance to death in molten steel shoes. It’s a dark story. I don’t think we’ve shied away from the darkness, and Disney actually didn’t either. They just took a very different approach than we did, but the heart of the story is the same. What does it add to the mythology to make this version of Snow White something of a warrior princess? ‘Warrior princess’ is something that’s external, rather than being internal to the character. She wears a suit of armor, but she’s not suddenly Bruce Lee’s adopted sister. She is wearing armor for protection, and she has to kill a queen. She’s not beheading people. She doesn’t suddenly acquire these skills. It’s very instinctual and defensive. She knows she has to kill someone, and that is abhorrent to her. That sword lies very uneasy in her hand. 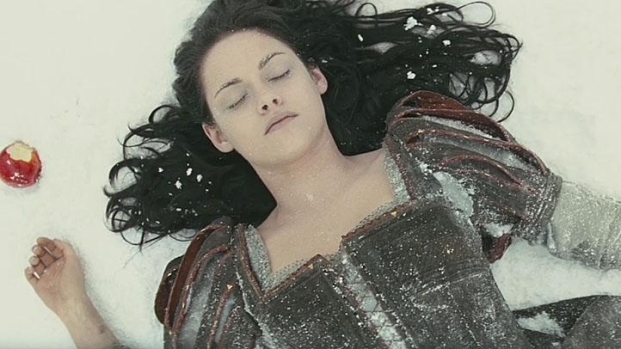 How did Kristen Stewart take to the sword work? I put that sword in her hand, as I would put it in any of your hands. If I told you someone was going to come through that door who had done something terrible to you and you had to kill them, I’m sure you’d f--king give them a good run for their money. That’s really how she fights. She’s no ninja or samurai. It’s purely reactive. Why did you decide to have eight dwarfs instead of seven? I don’t know, really. It’s just weird, how those things happen. It wasn’t like ‘We’ve gotta have eight dwarfs!’ It was like, ‘F--k it, let’s have eight dwarfs.’ The Snow White story – or Snow Drop – story, just had dwarfs. We weren’t trying to beat Disney; we just wanted one more... It’s really about another group of people who have lost everything, and they are touched by Snow White, and they decide that they will fight for their pride again, alongside her. They’re very instigative, in taking her kingdom back with her. They are funny, but it’s not slapstick humor. They’re funny because they’re funny guys. Ray Winstone delivers this beautiful, allegoric speech about what’s happened to them, as a tribe of people, and it’s really heartfelt. And then, he goes off and is really funny. We just let them go. They’re a hysterical bunch.